I asked Andrew, sitting across him from a desk. He smiled. Then he closed his laptop, got up from the chair, took a cup of coffee, and walked toward the sofa with me. “I think this is a problem to be discussed while we sit here”. “During WWII, my grandfather lived in London. At that time, Nazi Germany was air bombing the city. All women and children were encouraged to leave the city if possible. My grandmother took my mother to America, while my grandfather stayed behind. He was in charge of putting out fires in the city”. Much intrigued by the context, I leaned closer to him. “He suddenly remembered that the most common phrase Billy always said to him was ‘meow meow meow’, so he quickly flipped the pages to that phrase. Then, he saw the following translation:”, Andrew paused for a moment and took a profound look into my eyes. “What does it say?” I asked, unable to withhold my curiosity. “‘Tell me what you feel, not what you think’”. Andrew was talking to me the other day in the New Orleans Museum of Art (which by the way, has an extremely interesting architecture style. When we first walked from the grass in front of the museum toward its front door, it feels almost like a smaller copy of the national mall in DC with its majestic columns in the front of the building facing a fountain and a long grassland that extends all the way just like the one in DC. However, looking closer and I began to notice something strange. The roof is almost Chinese in style yet lacks the full coverage of the traditional tenon joint structure, with the outer edge surrounded by short green iron fences like East European façade; the square and straight-line style of the side building is like Islamic buildings in the middle east; the front of the building has giant Greek style columns yet failed to extend all the way to both sides of the building. As we saw the mosaic decoration on the ground of the interior instead of giant marble with shiny smooth faces, we finally realized that the building is an attempt to bring different elements from different architecture styles into one and be the melting pot of architectures. Very interesting. But very bizarre, in the eyes of a buttoned-up traditionalist like myself). Back to the topic, Andrew was talking to me about his opinions on art which totally blew me away and gave me a brand new way of thinking. I, as a pure materialist and rationalist, judge art by the amount of effort put into it. Andrew, as a romantic liberal, judge art by the transcendental message that it communicates. We were in one room looking at one picture painted by Modigliani, Amedeo called “Portrait of A Young Woman”. It depicts, as the names suggests, the face of a woman. However, unlike an ordinary portrait, the face is depicted extremely flat, with her eyes dull and black. There is no true to life detail at all in the painting. Especially on the eyes which are literally just two brush strokes of black colors. After realizing that Andrew was not joking, I tried my very best to look at the picture again and again, but in vain. It is still no more than a children’s painting to me. I just can’t think of anything. You have to trust me I was being very sincere. I did not mean to put Andrew in a complete burst of laughter. Nonetheless, my way of interpreting art totally caught him off-guard. So he decided to show me how he interprets art, or more generally, the beauty in life. He spoke of early music, written by composers who are paid by rich people to play cheerful notes which they were having food, doing work, or reading books. Never was the music intended to express any personal insights, rather, they were created to be perfectly pleasant to our ears. Hence all the beautiful and relaxing melodies played during dinner. He also spoke of early paintings. Painting as two dimensional decorations to fill the empty space on the walls not covered by furniture, paintings to show beauty and beauty only. No. They were not the type of art that he found most pleasure in. Andrew told me. This type of art, beautiful indeed, lacks the power to speak to him. There is beauty, but dull beauty, boring, able to sustain an indifferent glimpse, yet unable to hold a person for minutes and hours contemplating in front of them. Music too. Pleasant. Pleasant yet plain. Pleasant yet unmoving. Like a simple lullaby good for playing in the background and make babies quiet asleep. Instead, he found most joy in arts that speaks to him; in arts that connects to him; in arts that he feels. He showed me a picture of the sculpture, Laocoon and his sons. I was fascinated by the fine details of the sculpture and its absolute true-to-life representation. This was exactly the type of sculptures that I enjoyed, a total mastery of sculpture techniques. However, I was shocked when he told me that the sculpture was made a good two thousand years ago. I would totally have guessed this was the work of someone like Michelangelo. So it was a very clear point: human beings have mastered the techniques of sculpture two thousand years ago, a mere true-to-life representation is not enough to be extraordinary. It was only then that I began to realize the deep values in art works that break conventional rules. Sometimes, it is not just about creating the most beautiful thing. It's about ideas, values, messages, beliefs, feelings and every other humanistic expressions. When we were in the Evangeline restaurant, half of the table, myself included, continued philosophizing about life for two hours. During the conversation, we kept trying to define what is human, what is conscious, what is existence, what is time, etc. As far as I remembered the conversation, one of the only consensus we reached is that human is human because we are conscious of our consciousness and able to think about thinking itself. Other than that, the conversation went wild, unable to settle with any conclusive ending. Suddenly, I came to realize that Binx Bolling and I are very much the same in terms of our world views (except for his sometimes overly extreme cynicism and plain rudeness to other people. One example: he thought that all the friendly and likable people seem dead and only haters seem alive, which I didn't quite understand where did that darkness came from). Nonetheless, I'm same to him on many life philosophies. “During those years I stood outside the universe and sought to understand it. I lived in my room as an Anyone living Anywhere and read fundamental books and only for diversion took walks around the neighborhood and saw an occasional movie”. That was me, perhaps even more extreme than Binx. Reading only highly esteemed philosophy works such as The Republic and Metaphysics, I consider any other less known books to be a waste of my time. I don’t walk around the neighborhood for diversion. I consider that a waste of time as well. Only when I run around the neighborhood can I be convinced that I’m excising thus not wasting time. I’ll hate myself if I spent my precious time watching a movie. I went as far as trying to squeeze every bit of time out of my day to “do something worthy”, which eventually led to the purchase of a long board just to get between classrooms faster and several similar decisions like that. Binx likes to go to theatres and talk to people, because he found that “most people have no one to talk to who really wants to listen”. I like to do that to. I can listen to people talking for a long time and ask a lot of questions to keep them going. I even write like he does! A random thought would occur to him and he would talk on for several pages until going back to what he was originally talking about. Everywhere he went, he was thinking, searching, trying to read people. When Binx went onto his “search”, I can’t help but thinking it is the same kind of search I’m going through as well. Standing outside of the universe, trying to explain everything in the world logically, stripping all the sporadic feelings and emotions. I like to interpret history in purely materialist approach, that we are just genetically driven biological creatures who likes to make copies of our DNA as much as possible, that different circumstances, purely deterministic, led us to make unavoidable different choices, and created different paths of history as a result. When something gave me a pleasant feeling, I try to analyze why. Is it because it reminds me of a pleasant childhood memory? And I was pleasant then because my biological needs were perfectly fulfilled? Does the pleasure associate with my genetics or the environment that I grew up with? Do I like seafood because I couldn’t eat much seafood when I was a child thus attracted to things more rare and precious? Every single thing in my life, I try to find a perfectly reasonable and logical answer to it. As time passes, I become insensitive to emotions just like Binx. This was perfectly manifested in the way I approached photography, and consequently the way I interpreted art. I used to believe photography to be some rigid machine work. Obsessed with indisputable data, I bought highest end equipment with the best in market resolution and dynamic range. I used only prime lenses with the largest aperture, caring about nothing but sharpness--the only thing unable to be altered in post processing. I carefully learned all the advanced photoshop techniques such as luminosity masks, image stitching and stacking etc. In my mind at the time, photography was nothing but techniques. The result? A bunch of beautiful photos all looked exactly the same: overly saturated colors, perfectly straight horizon, carefully cropped according to the golden ratio, some stuff in the foreground, sunset over some stuff in the background, all HDR together, none overexposure nor underexposure in any area of the photo. This even influenced how I viewed paintings for that I would only admire paintings that required a lot of effort in the production. But what do I think of my photos now? Good postcard shots, maybe even suitable for desktop backgrounds, but definitely not photography. By trying to follow a rigid formula to create beauty, I gradually lost the ability to find moments of true sensation. By degrading everything down to numbers and benchmark tests, I became obsessed with the most trivial thing and forgot what truly touched me in the beginning. Basically, I stripped my humanity and tried to be a machine. Andrew told me the story of St. Paul. He doesn’t give everything a logical explanation nor does he plan to. When asked questions like “how to you know such and such is true?” he answered simply by “you know”. Sometimes we cannot explain everything rationally, such as what happens before the big bang, and a desperate search becomes in vain. In the end of the novel, Binx took his aunt’s advice, lived happily with Kate and became a charismatic half-sibling for her mother’s children. Did he succeed in his "search"? I think he did. So what indeed makes human human? Andrew never directly answer my question, but I think I knew the answer quite well now. We had the wildest experience in a mere span of one day. Waking up in the morning, we all got ready for a seminar that focused on A Lesson Before Dying. It is a book about the last days of a wrongly convicted young black man before his execution. It’s a truly powerful book that touches deeply upon several of the most profound themes in the United States. Slavery, legal system, racism, just to name a few. The day before, we took a tour around the old prison cells in Pointe Coupee Parish just like the book described. Darkness, rust, cluster, lack of air flow, extreme humidity and heat, strong stench, the condition of the prison cells is more than terrible. We are able to feel for ourselves the condition that Jefferson, the wrongly convicted man, lived through awaiting his impending death (Although, I would imagine the plantation life to be not much better for him. But nonetheless, the prison is probably as worse as it could possibly get for Jefferson). During the time process, his humanity has been shed away by the white lawyers, juries and justices. Described as a hog rather than a human, Jefferson has lose all confidence in himself. He would deliberately imitate a hog, deliberately piss off his loved one. However, with endless loves from people such as Grant, Miss Emma, Reverend Ambrose and the entire community, the true worth were awaken inside Jefferson and he was able to realize that he was loved, he was capable of being loved, and he was worthy to be loved. Eventually, Jefferson calmly embraced his death with dignity. Andrew recited Shakespeare Sonnet 29, a poem about a desperate person regaining hope after realizing that he was still loved. We were all in absolute silence. We stepped out the hotel room and headed for Dr. Gaines’ house, the author of A Lesson Before Dying, hoping to learn some deep insights from the very author of the novel. We approached him with a very solemn respect for him and the subject he writes on, only to find out that he is a very funny and relatable guy. When asked how he created those characters, he responded “you don’t know what to do with them. You just create those characters. As you write along, you figure out what to do” We also asked him about his writing process to which he responded “you know the beginning. You know the ending. And you have 200 blank pages to fill and that’s it”. Frankly speaking, I did not get quite as much insights as I expected from the meeting. However, one photo shocked me quite particularly. It was a photo of Dr. Gaines’s aunt, who has a terminal disease that makes her only able to crawl on the ground for her entire life. It was this disabled woman who single-handedly brought up twelve children from the plantations house, during an era of Jim Crow laws and lynching in the deep south. It was also this woman who, when wishing to discipline her children with planks, her children would unconditionally obey and kneel before her to take the beating. Dr. Gaines only talked briefly about her but I was deeply touched by the extraordinary character of her aunt. The women in the middle is Dr. Gaines' aunt. Andrew took this photo. The day did not end just there yet. After water tubing, we drove away from the parish to a place called Bayou Cabins several miles east of Lafayette. It is the most bizarre housing run by the sweetest most incredible southern lady who cooks the most sumptuous breakfast one ever live to witness for us every single day. Stepping outside of the van parked above a specially selected glade under the enchanting shade of the bayou forest with the perfect amount of cushioning and fractions and water permeability unsurpassed by any lame concrete pavement works commonly seen in cities, I was immediately amazed by the luxurious opulence of the architectural magnificence of the cabins capable of putting the Château de Versailles in a shameful blush. Opening the door and a smell of meticulously developed fragrance made up with the odor of antique air conditioners, uncirculated air, cup-price air freshener and some secret ingredients known only to the owner of the place unique to each cabin blew pleasantly on my face. In fact, the furniture and the interior decoration was so stylish and comfortable that even low forms of life such as ants and cockroaches gathered together in the cabins to appreciate its sheer beauty. Some say it is like a 5 star hotel, I take that as an insult to the majestic Bayou Cabins. Others say that it is the best place they ever stayed in their ten years of travelling in the United States, I totally agree and think that they’ll never find a better place ever again. Sometimes at night, I just find myself lying on my bed staring at the ceilings of the cabin, where even the spider nets seemed dreamingly artistic under the carefully designed, handcrafted and true-to-life manual operated ambient lightening system and the pleasant melodies from the nostalgically classic air conditioners. Good grace this place was the best! No wonder Lauryn was able to have accomplished such a chivalry act of kindness by humbly relinquishing her possession of the entire bed to the lonely bug that sought the warmth of her blanket and the company of her kind-heartedness at night. Everything about the Bayou Cabins is just Amazing! Add ever more drama to the already sensational day was our dinner at Randol’s, a local favorite featuring a restaurant, a bar and a whole hall with wooden floor and a stage filled with band members dedicated exclusively to dancing. Peering through the plastic glass that separated us and the dancing hall, I was able to see one young looking man dancing eagerly among a group of elderly folks, all of them, although unable to move as swiftly as when they were young, were so immersed in the joyful fast-tempo Cajun music that it seemed like their body just naturally undulated with the waves of notes coming from the stage all by themselves. After finishing our pleasant dinner, most of us joined the dance. A moment of pure pleasure where everything but the movement of the body is forgotten. What a cheerful way of life! The following day, we went to a Cajun music gathering at a local café in the town. When we went there, the music was just set to begin and once again, we were embraced by bursts of hospitality from local folks. The guy who played the infamous iron water bucket bass (I couldn’t remember his name, sadly) was particularly interested in introducing us to their musical insights and all the beautiful stories in the lyrics about family and love. As we were all totally captured by the music, Andrew picked up a viola from the middle of the group and started playing along with them. The entire group looked ever so joyful. It was by this performance that I truly come to appreciate Floyd’s concern for his little girl. “The ample laps of aunts, daily thunderheads rolling above flat parishes of rice and cane, the musical rattle of French, her prayers, the head-turning squawk of her uncle’s accordion, the scrape and complaint of her father’s fiddle as he serenades the backyard on weekends….” All of those are unique identities of the Cajun culture that you can only truly come to appreciate by experiencing it on the spot The hospitality, the expressions, the endless music, the easy-going characters, constant bursts of laughter and everything else that makes the Cajun culture. If they are all tripped away from the girl, good heavens will she be forever haunted by her memories for the rest of her life. The culture provided people here with such a strong identity, whom in turn intensified the Cajun culture, a circle of continued benevolence. Later that afternoon, we met the same group again in a local brewery enjoying life. The person who played the viola (I’m so bad with names I feel very sorry) told me that he was born and raised here and then became an engineer in Los Angeles for a long time before he came back eventually. So I guess there is always something about our home and our childhood that bond us to some particular culture and particular place. For him, it is the Cajun culture he was raised in right there at Breaux Bridge. Eventually, a high salary from a respectable occupation in one of the world’s largest cities still cannot beat the sound of viola and a sip of cold brew at home. For myself, it would be my hometown Lanzhou. Since my parents all came from different parts of the country and none of us speak the local dialect, I never viewed Lanzhou as my hometown and always wanted to get away from it when I was a kid. Finally, I succeeded in going to schools on the other side of the earth, only to find out that I started missing it desperately. It is part of me. Shed it away, and I become like a tree with its roots cut off. It is where my home is and where I feel the most at ease. Right now, everywhere I go, I introduce that I’m from Lanzhou as proud as a peacock. It meaning to me gets stronger as I grow, just like Breaux Bridge is to the viola performer, and Louisiana is to Grant Wiggins and Dr. Gaines. To modify the quote from Dr. Gaines, of us has body and mind everywhere, but soul bounded firmly in our hometown. Hot. Humid. The smell of alcohol and piss. The street is half tourist half drunk. Come on gang. One second late, we’ll have to stand in the back. Where are we going now professor? One person. Two persons. Thirteen worn out figures on the edge of total defeat by the cruel weather. Lean on the wall gang. Try to keep the street clear so people can walk by. One minute. Two minutes. Fifteen minutes. Some drunk guy walked by. People with reservations, please line up this way. Thank you. Is this the back of the line? It’s actually the front. Don’t worry though. Last year we were way back and still got in. Bursts of laughter. Concentrate. Concentrate. You have a novel in your hand and you should be reading. Thirty minutes. Three quarters. One hour. If you are 21, use the restroom right next door. If you are under 21, walk three blocks that way. Sweat. Thirst. Fatigue. I should get some water for the gang. Eric, would you mind holding the camera for me? Stand. Stretch. Pour. Try hard to keep from the wall because it’s covered with filth. Then the door opens and I went in. The moment I’ve been waiting for too long. The legacy of Buddy Bolden. Buddy and his Band. Andrew and his gang. Eric sits on the ground. In the middle of the very first row, a mere two inches from the trumpet player. This is the first ever live jazz performance for him and he managed to get this close. “What a blessing”, he thought, while trying to observe every detail of the band member’s pre-performance preparations to enjoys his privilege of this proximity to the fullest extent. He can see the drummer carefully laying out all his different instruments on the ground. He can hear the cornet player casually chatting with the band about dinner plans. Laughing, and he smiled. Eric likes jazz, just as he likes all other kinds of music that brings him pleasure. He likes it, but is not crazy about it. He plays piano, of course, just like all other middle-class kids from China are forced to. He neither enjoys it or hates it. He just goes along with his parents’ expectations. So his level of music understanding is moderate. Not too bad to look ignorant, nor too good to impress others. When the drummer started the first beat, everything in my world ceased to exist. My own existence started to fade away as the sound of music penetrates every single cell of my body and dissolve them. Then, gradually yet persistently, they became part of the music. The music grew into me. I’m no longer an observer. The entire music consists of music, and music along. My fingers, my shoulder, my neck, my foot. Every part of my body started dancing in sync with the music. I’m a part of it. Sweat dripping down from the forehead of the trumpet player onto his glasses. Some escapes and continues down his chin, onto his hands, his instrument, and eventually onto the ground. Every now and then, amongst the short bursting intervals where he is not playing, he quickly draws his right hand from the trumpet and pushes his glasses up. As sweats accumulate his glasses keep sliding down more often until a threshold where he cannot bear it anymore so he takes out a piece of napkin from his chest pocket and wipes his entire face and keeps playing. He is so immersed. So immersed that the obnoxious sliding glasses post no obstructions to the flow of his music. Even Eric, sitting so close to be able to count the number of his sweat drops did not notice all those actions. Clapping. Yelling. Roaring from the audience. Big smile on the performers’ faces. Only when the last punch on the drum set stopped was Eric able to regain his conscious. He did not clap. He could not. The large smile stayed on his face. He couldn’t control it at all. The music took over his body, it took a good minute of roaring from the crowd for his mind to reclaim authority over the body. Then, the only sound out of his mouth was “wow”. Well, Buddy Bolden it is. In the loose sense that I could always find some novels or movies that set in the same places that I visited, pretty much all the trips I went on had some “bookpacking” characteristics to it. For example, the vast prairie in Inner Mongolia reminded me of Wolf Totem (狼图腾) written by Jiang Rong; the forests of Khingan Mountains reminded me of Tracks in the Snowy Forest (林海雪原) by Qu Bo; going to New Zealand and realizing “wow they filmed Lord of the Rings here”. However, none of my previous experiences was driven by those works of literature and art. They were just sweet additions to the trip, some little “oh I remember that!” moment. So strictly speaking, this is my first ever genuine bookpacking trip. Instead of going to a place and try to think of novels that set there, we reverse that thought process and follow the footsteps of characters in great novels, actively seeking and unpacking the culture and history of that place through literature. The attitude changes from that of a passive observer to an active seeker. That is what makes this trip invaluable. Prior to the trip, I was nervous not only because I’m the only boy, but also because I’m quite illiterate, I would say, comparing to all my travel companions. This fact was manifested later on when we had a group discussion about The Awakening. From the beginning till the end, I was shocked by their deep understanding of the novel and the richness of their interpretations. When they were discussing the different symbolisms used in the novel, my understanding was still as shallow as whether the protagonist was mad. Plus the fact that I had a serious cold right at the beginning of the trip, my mind was all over the place (I guess in this sense I did successfully get way out of my comfort zone. I almost coughed my brain out to the oil rigs in Mexico Gulf). Nonetheless, I enjoyed the entirety of the trip right from the beginning. The first thing I want to talk about is, of course, food--one of the most essential part of human life beyond any doubt. Right when we stepped outside of the airplane, there was advertisement of food everywhere--much more than any other airports I went to. Even with the definite confirmation bias coming from my hunger, I still found the food advertisements to be extremely excessive. In fact, I appreciate this a lot. One of my favorite documentary was A Bite of China by CCTV. Each episode of it gradually unfolds a part of the Chinese cultural through food. “Food”, in this sense, is not simply what’s in the plates and bowls. It represents the larger life philosophy of people in that culture, their relationship with nature, their interpretation of the environment, and their legacy through history. It a entire human-nature dynamic that represents arguably the most important facet of our life. From the selection and preparation of ingredients, to spices, to culinary methods, to how it was finally served, every single aspect of the food is like a condensed mirror that reflects the culture it sets in. One fantastic example to demonstrate this is crawfish. Both Southern China and Louisiana are huge consumers of crawfish (based on my personal experience. I don’t have statistical data of any kind, but damn do people love to have spicy crawfish during the summer in China), however, how crawfish is cooked is vastly different. In Louisiana, I’ve had crawfish stewed with shrimps in “seafood gumbo” soup; crawfish smothered in cajun sauce and served over rice as “crawfish Étouffée”; served as the main ingredients of “crawfish omelet”; served as embellishments in “shrimps and grits”, etc. All of those are vastly different from how crawfish is cooked in China: stir-fried (with shells attached) with all kinds of spices including red pepper, Sichuan peppercorn, garlic, green onion, Chinese chili bean sauce, etc. Therefore, the same exact ingredient from preparation (peeled vs. whole), to spice selection, to the culinary method (stew vs stir-fry), to how it is served (eaten with containers and utensils vs. eaten with hands and chopsticks) was completely different. It’s always fascinating to see how food is prepared differently in different cultures. When I was in Rhode Island, their signature dish was the extremely creamy clam chowder with oyster crackers and the breadcrumb stuffed “clam casino”. Coming over to the pacific coast, I had seafood ceviche for the first time which has a whole new taste I’ve never imagined to go with seafood. The sourness of the ceviche almost remotely reminded me of Ethiopian cuisine, with their sour-tasting fermented injera almost threw me off the chair the first time I had it. Down here in Louisiana though, I found a more subtleness in the use of spices. It’s more balanced and less extreme. 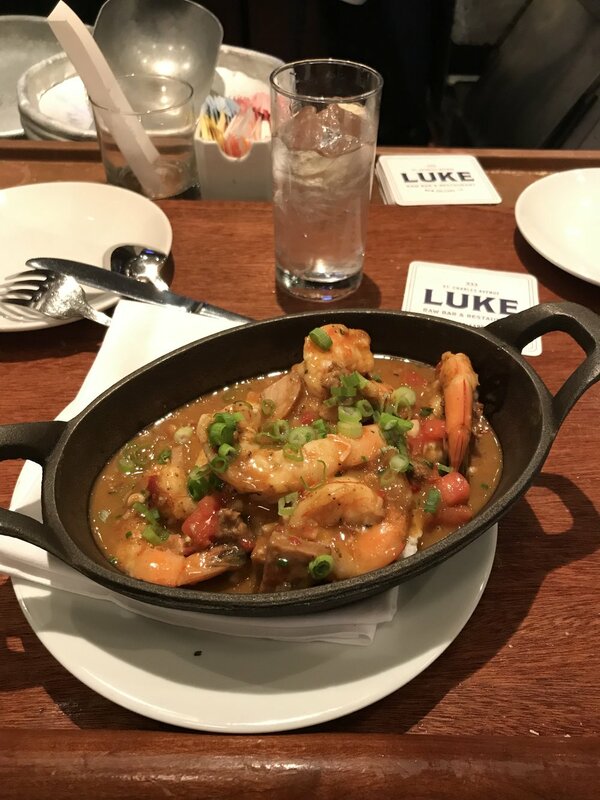 In the shrimp and grits I had, I could taste many different spices all in harmony with each other, and none of them surpassing the original taste of shrimps themselves. Although sometimes the poorly cooked seafood gumbo tastes too excessive on salt and pepper, they never let the taste of spices take over the taste of the main ingredients. Even the pan-seared fish I had on Friday (I forgot what fish specifically) had just enough flavor to not be tasteless and accurately recreate the tenderness and freshness of the fish meat. It almost seems that there is this ideology in New Orleans cuisine to never let any one flavor predominate (Or, if there has to be one, let it be the taste of the original food). I’m certainly far from having had nearly enough food to make any conclusions, but I think there is a vague pattern already emerging here. However, one thing that I hate to mention abruptly breaks this pattern. This is the deep-fried cuisine predominant in Grand Isle (or presumably, all over America’s south). To some extend, I do see some values in deep frying. It does make some otherwise boring ingredients tasty. However much I hate to admit it, french fries is just that good so that whenever it is served, people completely forget about the health concerns and calorie intakes or whatever and devour on it. But, I see no value whatsoever in deep-frying every single eatable thing they can dig up on this planet. 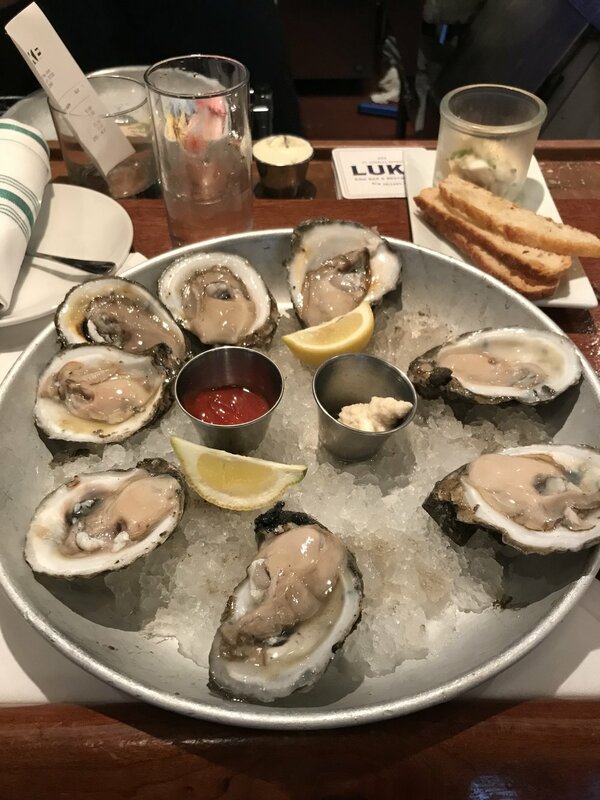 It’s such a betrayal to those shrimps and oysters and crabs who tried so hard to become so tender and fresh and tasty and prepared to sacrifice themselves to the taste buds of human beings yet only to find out that they are mindlessly thrown into hot oils and eat alone with the damned ketchup. There are a million ways to cook a chicken in China, and seems like there is only one way to cook a chicken here. If I’m a chicken, I’ll probably choose the more honorable death of being carefully seasoned and stir fried then stewed than chopped into large pieces and deep-fried. There is not even diversity in the chicken heaven here. What a shame. I’m glad that at least there are some sensible cooks in New Orleans, otherwise I would seriously consider the lifestyle of a koala for the rest of my visit. It was also very interesting for me to find out that one of the waitress in the starfish restaurant, and the owner of yum’s both prefer Chicken over seafood. The waitress actually said that she hates seafood. I was surprised at first that they as people who have easy access to the sea and have no difficulty obtaining the freshest seafood everyday despise it instead. But when I thought about it more, it made perfect sense to me. I’m from northwestern China, in the middle of desert-like mountains thousands of miles from sea, it’s crazy expensive to have any seafood in my hometown. Intriguing, as a consequence, my favorite food has always been seafood. If I have any option for fish or shrimp I wouldn’t even glance at the meat. Perhaps people just value things that are rarer? Back to the topic at hand. I actually started writing this blog piece after I have read everyone else’s. Apart from the the endless admiration for their poetic writings, it seems to me most people had some sense of “escape from the city” and "awakening" in the sense that they could clear their minds off of stressful things back in the university and focus on enjoying their life on Grand Isle. I think this is a fascinating mindset, as lovely as the life philosophy of "the French people" described by Andrew--the sense of living the life to its full extent by spending every possible moment in enjoyment. I find no better way of describing it than this quote from Melissa: “Life was slow. So slow that each moment seemed to pause briefly, allowing me to stimulate each of my senses and consume that time with gratefulness, knowing it would not return.” Indeed, life was extremely slow on Grand Isle. So slow that Melissa was able to stimulate all of her senses and enjoy it with gratefulness; and so slow that my patience was running seriously thin all the time and freaking me out. Whether it was at the JoBob’s or Subway, the owners are really taking their time for each order, seriously reminding me of the sloth working in DMV in the movie Zootopia. And here is a funny story: the lady working at Subway literally stared at me for three seconds with a totally confused face as if I just took off my shirt and started dancing Michael Jackson and asked with the most doubtful tone I’ve ever heard: “are you sure you want avocado AND tuna AND chicken?” while deliberately emphasizing and elongating the pronunciation of each conjunction word for the ultimate dramatic effect. After I nodded, she replied “okay, okay, it’s your sandwich, you can eat whatever you want” with a disapproving tone while putting her hands up in the air and and shaking her head as if I just ordered a dead rat sashimi. Her expressions were so funny that I could not stop picturing her going back to home at night and telling her kids in that exact same tone: “can you believe that? I just met the weirdest guy on entire Grand Isle. He ordered avocado AND tuna AND chicken! Good grace!” Anyways, I witnessed an entirely different business attitude on Grand Isle. An attitude that is relaxed and laid back; that is more stochastic than structured; that is more emotional and attached to personal emotions and feelings than rational and attached to rigid work rules and schedules. And not just on Grand Isle. The private museums we visit in New Orleans hardly follows their business schedule. The lady at the 1850 House simply rejected us even though it’s during open hours; Andrew had to call several times the owners of each museum to make sure that it is operating when we come. It’s just fascinating how local people run business down here. Just imagine a Subway employee making fun of your orders in downtown Manhattan while there is a long line all the way outside the store and you'll know what I'm talking about. Interestingly, it’s not the first time I’ve seen this kinds of attitudes. Some villages in China that I’ve been to also have this sense of "slowness" in their attitude. It seems like the quick tempo becomes a unique characteristic of the city life. For most of my fellow bloggers, such slowing down of the tempo and relaxation was great. However, I personally find it hard to deal with this sluggishness down here. Down in Grand Isle, it is supposed to be the relaxation and journey to explore ourselves without any forced schedule, but I had to force myself into having a schedule in order to stay active. I need to know from what time I should be swimming in order to get back for lunch in time; in what pace should I be reading the novel in order to finish it before group discussion; when I need to get up and take the shower before seminars, etc. So quite opposite to, for example, Ryan who totally refreshed her mind in the freedom that Grand Isle offers, I had to force myself into that school pattern in order to feel alive and not rot in my bed doing nothing. I guess in some sense, my stress comes from not knowing what to do exactly and the way to ease my stress is to have everything figured out. Therefore, when Andrew compares the “British mentality” and the “French mentality”, I slapped my forehead and realized that I have the exact mind setting as the prior example: whenever I’m not working, I’m wasting my life away. I took this photo at the Grand Isle State Park. I was purposelessly looking at the sky but then suddenly saw these two lines of birds flying by. Their colors were in perfect contrast. I was fascinated so I took this picture. Still on Grand Isle. An old man walking with his dogs to find a fishing spot on the deck. Everything seems so slow, quiet and tranquil. We were doing a swamp tour just outside of New Orleans to see alligators and living conditions of native Americans and early colonists. Then I saw this wonderful crane (goose? swan? ah I wish I know birds) standing in the waters. Just as I was about to press the shutter, it took off. Hence this beautiful photo. So I began to let loose of my minds. Go to the beaches just for the purpose of going to the beaches; quietly watching the sunset without constantly seeking for a camera spot and worrying about exposure bracketing. Almost every single of my action was calculated with cost and benefit: “if I go to the beach, would I have enough time left to read?”, “If I go take pictures at the pond, do I have time to go back and capture the sunset at the beach?”. Then I started to let go of the careful calculations and follow my feelings. If I feel like swimming at the moment, I go for it, not caring what do to after. Would I call this my own “awakening” like Edna? Maybe not (Well, to be fair, Edna always has her awakening moment after sleep. This never happens to me. I need to think hard to realize something.) I believe that human life is fluid and dynamic, maybe there is a “better” choice at the moment, but there is definitely no purely black or white in life, and there is no walking from one extreme to the other either. We make changes as we go. Some incidences may seem dramatic at the moment, but as trivial as a sand on the beach when we look back later on. As long as we are not stubborn and embrace any changes that could benefits us, we can live a happy life. To me, there is one thing that is the same for “the British person” and “the French person”: the pursuit for happiness. They just defined it differently. Maybe the British person values happiness in the future more than the French person, whom in turn values happiness at the moment more than his/her opponent. We don’t have to completely ditch our own ways of life and fantasize the others’. Maybe the constantly working British person is the one who gets more bread and laughs till the end, and the romantic French girl cannot enjoy her life in the coffee shop anymore because she is unemployed and cannot feed herself. Maybe we'll end up like Edna if we become too extreme. Maybe Edna died with utmost happiness. Who knows. Life is in our own hands and it's up to ourselves to seize it. I look forward to the journey ahead. all of these photos are taken at the same place during the same time period. The color on this photo is more or less an accurate recreation of the scene. I adjusted the colors for the other photos to create a more artistic feeling.